Pneumatic Needle Valves are used to reduce the rate of flow in a leg of a pneumatic circuit, consequently slowing actuator speed. Unlike a Flow Control, a Needle Valve is bi-directional, meaning it controls flow in both directions instead of only one direction. A finely threaded stem allows the gradual adjustment of the amount of controlled flow passing through the valve. Flow enters the input port, travels through an orifice sized by the tapered stem and out the output port. 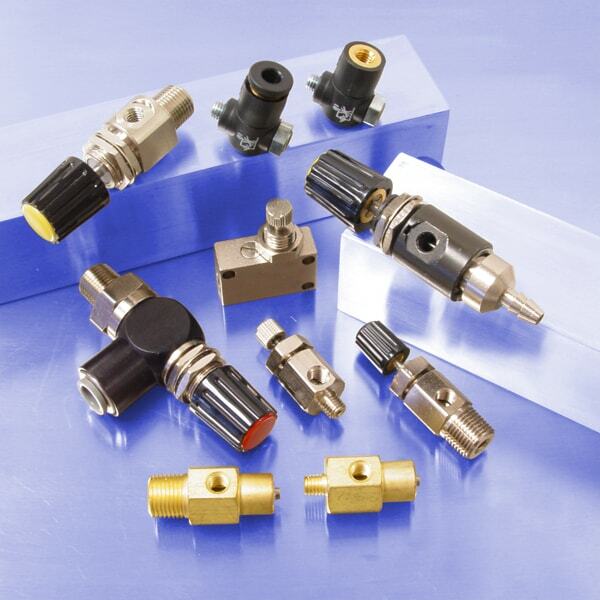 Pneumatic air valves are typically made from brass, bronze, steel or metal alloys and may also be anodized to provide corrosion resistance. Pneumadyne offers micro needle valves with various input and output port options and in a range of flow rates to meet your specific requirements. View our needle valve catalog for performance data and additional specs for our pneumatic needle valves. Request a quote for your air needle valves today or contact us for information about our custom solutions. Needle valves play an important role in regulating air flow, pressure and direction in your pneumatic system. Selecting the right micro pneumatic needle valve for your system will help ensure efficiency and prevent leaks and safety issues.